Men vs. Women - Who's the Better Decision Maker?Men vs. Women - Who's the Better Decision Maker? My feminist daughter asserts that the differences between men and women are just socially induced and not inbred. I strongly disagree and she gets bugged by my beliefs which makes me want to express them more obnoxiously as, much to her chagrin, I like to see her reaction. Contrary to her beliefs, I hope to show how men and women differ and how it can often lead to women being better decision makers than men. I imagine she would not dispute the latter assertion. 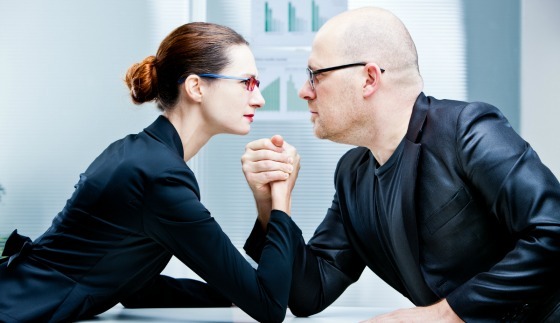 Men vs. Women – Who is the Better Decision Maker? There is such tremendous value in working with constraints in life. It breeds better decision making and creativity. Investors and CEOs often violate one of John Wooden’s Cardinals of mistaking activity with results by trading too much and engaging in value-destroying acquisitions. Vast arrays of investment options with low-cost liquidity have not made investors more successful. On the contrary, it’s exacerbated the tendency to take unproductive, return hurting action. From a corporate perspective, cash has truly proven to burn a hole in one’s pockets as most acquisitions do not produce the returns management thought and tend to harm value over time. Not surprisingly, the vast majority of CEOs engaging in M&A are men. That is why I like real estate. A well-located property that is maintained should continue to be the gift that keeps on giving and it’s much easier to continue to hold it then to actively trade in and out of properties. Once you have a property you know very well and it is performing well there is a huge risk in selling it and keeping the money in cash waiting for better opportunities or reinvesting in other properties.This is particularly true if the tax consequences of selling are high. The inclination to act even when it is against our best interests is called Action Bias. John Wooden preached against this years before it became so formally named when he would caution his players and coaches not to confuse activity with results. Investors often make this mistake to their severe detriment. The second article is from Harvard Business Review and discusses how slow decision makers are more effective than those who make snap judgments. 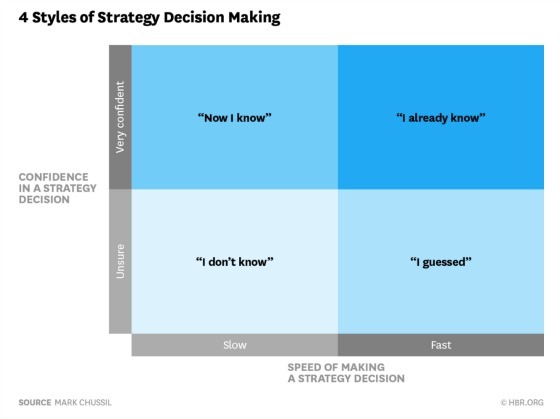 The author breaks down decision-making into four quadrants as the following table depicts. With the research concluding that women are better decision makers than men, what is it about women that might make them more patient and more effective decision makers than men? The author believes it has to do with men having more misplaced confidence than women. So what is about the wiring of men and women that make one more confident than the other and the latter being better decision makers on average? One place to turn is the Myers-Briggs Type Indicator (MBTI) assessment which is a psychometric questionnaire designed to measure psychological preferences in how people perceive the world and make decisions. There are eight preferences broken down into four categories of two. So for example, people fall into either being extroverted or introverted. The table below shows how men and women differ in each of the categories. Thus, if women, in general, are better decision makers than men, then we can look at the tables below and see where they differ most materially to draw inferences about what may make them so. Not surprisingly, women are much more feeling oriented than men, who are much more thinking biased. Interestingly, women are more judgment oriented than men whereas men are more perceiving oriented. And yet, from the previous research, it would appear that when it comes to important decisions, the feeling orientation of women is more dominant than their judgment orientation such that they will take more time to make important decisions than men. When putting all of the characteristics together, there are 16 combined categories combining the various attributes. Not surprisingly, females are far more dominant in the first two categories which involve feelings. Whether they are introverted or extroverted this is combined with being sensing, feeling, and judging. But maybe I’m wrong. And yet if I’m asking that I might be wrong, then maybe my decision-making process is more like a woman’s. And if this is the case then maybe everything I just wrote about is pure conjecture from an overconfident man extrapolating from only a couple of pieces of data. And yet, I am The Decider so I have to believe I’m right because that’s what men do. We decide and tell ourselves we are right and hate to admit we are wrong and change course. It has now become more clear to me the benefits of doing nothing most of the time. This decision-making stuff is hard. I now realize how fortunate I am to have the bulk of my net worth invested in real estate. There are so few decisions I need to make and because it takes so much time and money to trade in and out of that it rarely crosses my mind to do so. And this has turned out to be a huge benefit as it has allowed me to be able to follow Buffett’s and Munger’s sage advice. I have been limited in the number of decisions I can make due to capital constraints, what I have invested in has been of high quality, and the result has been I can be paid for sitting on my derriere. I wonder what my daughter will make of all this. Do you agree with Ariella or with me? Did my blog change your mind? Who are the better decision makers? Men or Women?